We left Koh Phangan for a couple of days to re-activate our multi-entry tourist visa. Since we didn’t have to go to the Thai embassy in KL, it was a cruisy break. The multi-entry tourist visa is a new invention for Thailand. You can only get it in your home country, and the six months begin on the date you applied for the visa. They are really aiming it at people coming for a single, long visit, and trying to weed out the backpackers and long term travellers. Fortunately, we had gone home for Christmas, so we were able to try it out. Traditional patong ko for breakfast in Surat Thani, then off to the airport to fly to KL. 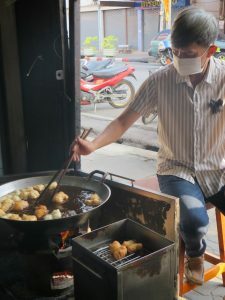 Deep fried dough balls may not be the healthiest of breakfasts, but dipped in super-strong Thai coffee, they are a power boost! In Kuala Lumpur, we were welcomed to our guesthouse by the super-friendly Mabel, and settled into our Kuala Lumpur routine. Breakfast alternating between Jenny’s favourite, Lucy in the Sky cafe, and Ravi’s favourite, Vinny Jaya Indian. Proper buttery scrambled eggs and cappucino one day, roti cannai and Milo ais the next! 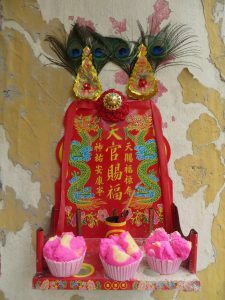 The spirits, meanwhile, were chowing down on intensely artificially coloured vanilla cupcakes. 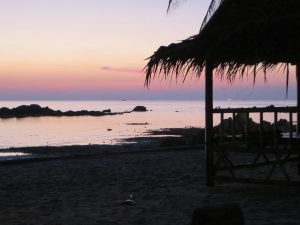 After a couple of days, we headed back to Koh Phangan to do Agama’s Yoga and Psychotherapy course. Historically, psychology and spirituality have been mutually suspicious. Spiritual traditions claim that massaging the ego is a counterproductive waste of time, when the true goal is to transcend it. Psychology sees spiritual bypassing and the use of spiritual jargon to justify denial, projection, and even sexual abuse in spiritual communities. Based on Indian tradition, and informed by modern scientific research, Agama seeks to find the integration of spiritual tradition with modern psychotherapy. The core of this integration is recognising that subconscious blockages and resistance are obstructions to the free flow of energy through the astral, or emotional body. The more freely energy flows, the faster one can reach enlightenment. While one can reach enlightenment with a physically weak body, it is easier if the physical body is strong and balanced. Likewise, the pranic body. And, just as much, the emotional/astral body and the mental body. The Yoga and psychotherapy course maps out how the different bodies and chakras influence one another, and provides a practical methodology for clearing subconscious blockages from the astral/emotional body. 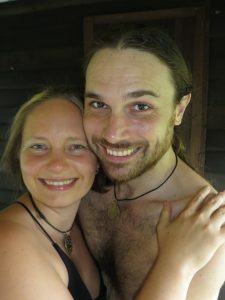 We did the course with the two teachers who developed the content – Elica, a psychotherapist, and Maha, a Western-trained medical doctor and yoga therapist. And it was a great program. Ravi developed a stomach bug the night before the course started, possibly psychosomatic. Maha helped him out with a remedy, and told him to come for a proper consultation after the course. We met some amazing people in the course, including the lovely Sunny Ju. She volunteered to feed our cats for us the next time we went on a visa run. By now, we had made our little house very much into a home. 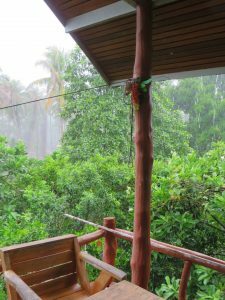 The porch was a cozy place to work, even in the rain. 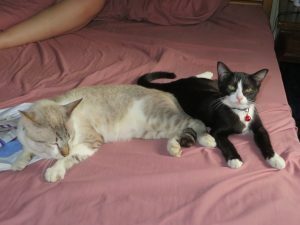 We had two cats, which always makes a house into a home. Krishna continued to be the most loving cat either of us had ever met. He would greet us with repeated dives onto our feet whenever we came into the room. Hero was a bit more reserved, but he was warming to us. And the two cats would now snuggle up together. We found the restaurant supply supermarket in Thongsala, called Makro. 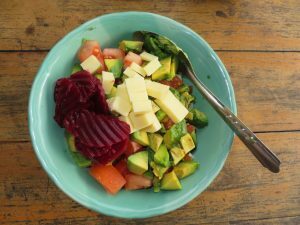 This gave us the opportunity to buy exotic foods like beetroot, avocado, and camembert. It was still an uphill battle for Ravi, who has a strong prejudice against making food at home. Even though just about every meal we made at home was delicious, he kept wanting to eat out. The budget, however, just doesn’t stretch to that! We restarted the weekly discussion circle on relationships. Again this year, we held it at Samma Karuna, because Agama had “no room in the schedule” for it. Samma Karuna’s yoga shalas offer amazing views of the sunset. Because of the teaching schedule at Samma Karuna, we needed to start the discussion at 7:15pm, a little later than we would like. We met some wonderful people at Samma Karuna. This is Amelia, a bouncy acro-yoga teacher from the USA. 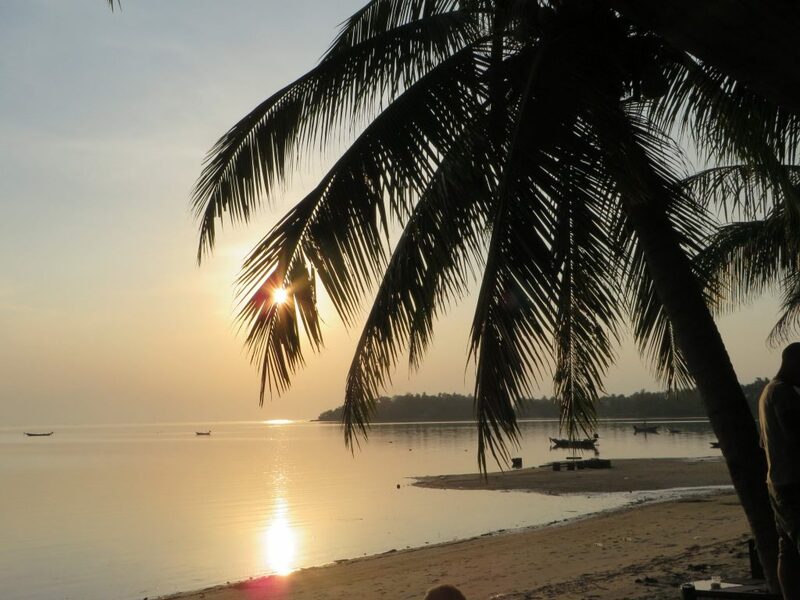 She was on Koh Phangan for a few months – longer than she had originally planned. Koh Phangan seems to have that effect on people. Fortunately for our dengue risk profile, Maha and Elica both suggested that we move the discussion circles to the Agama Healing Centre. The studio there is not only fully enclosed, it is AIR CONDITIONED! We did a six-week transition process of running circles in both places. Happily, we made the location shift with no loss of attendance. During this time, we noticed Krishna becoming a little unco-ordinated. Day by day, he had less control over his back legs. After a week, he was dragging himself around by his front legs, and we took him to the vet. The vet was perplexed, and gave him an injection of painkillers. She said she couldn’t keep him for observation, as she was about to go away for a week. 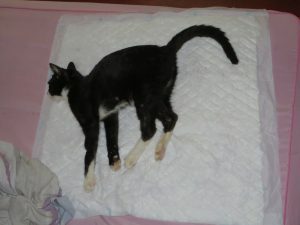 Two days later, he was still getting worse, so we took him to the other vet on Koh Phangan and asked for a blood test. He had a blood parasite, and we started giving him antibiotics for that, but it wasn’t one that caused paralysis, so this vet was also perplexed. Within a few more days, he couldn’t walk at all. And he stopped eating, even if we put food in his mouth for him. Finally, when he stopped being able to swallow water, we reluctantly took the decision to have him put to sleep. The vet seemed as upset as we were, and refused payment, telling us to make a donation to feed street dogs instead. He was a sweet, beautiful, loving cat, and we were devastated to lose him. The only consolation was that his suffering was finally over. It had been heartbreaking to see, and we are sure he is enjoying himself in cat Heaven.